The near final bits (Release Candidate) of Windows Virtual PC and Windows XP Mode for Windows 7 RTM are now available for download. Windows XP Mode (XPM) is basically built as a side feature of Windows Virtual PC – the next version of Microsoft’s client virtualization technology and comes with a free fully licensed and pre-configured copy of Windows XP Service Pack 3 (SP3). Windows Virtual PC provides the capability to run multiple Windows environments such as Windows XP Mode from your Windows 7 desktop. Windows Virtual PC requires a CPU with the Intel™ Virtualization Technology or AMD-V® feature turned on. This feature must be enabled in the system BIOS. Windows XP Mode and Windows Virtual PC are free to download and will only run on Windows 7 Professional and Windows 7 Ultimate editions and requires a CPU with hardware-driven virtualization technology. 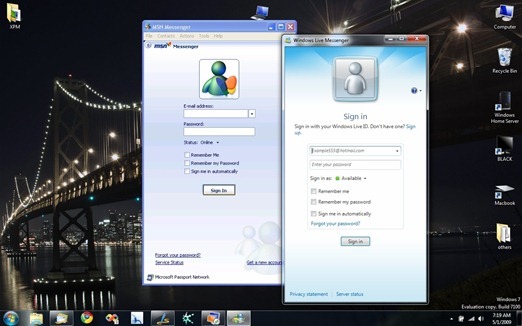 The Beta version of Windows Virtual PC and XP Mode were released earlier in April of this year. The final version of Windows Virtual PC and XP Mode (XPM) will be available to Windows 7 Professional, Enterprise and Ultimate users on October 22 – consumer launch of Windows 7. Check out this article for a detailed review on Windows Virtual PC and Windows XP Mode (XPM) for Windows 7. Just gave it a shot. Worked amazing!